As well as building homes directly, we also help housing associations and other providers to build new homes - whether through the 5,500-home regeneration of the Woodberry Down Estate, or through grants made up of money from homes sold under Right to Buy to help make smaller schemes more affordable. Since 2011, more than 1,500 homes have been completed at Woodberry Down - with more than half for social rent and shared ownership. We predict another 900 homes will be built there, or by providing grants for schemes elsewhere, between 2018 and 2022. Woodberry Down is one of Europe's biggest single-site estate regeneration projects, and is led by a partnership of Hackney Council, Berkeley Homes, Notting Hill Genesis, Woodberry Down Community Organisation and the Manor House Development Trust. Over 20 years, the estate will be completely redeveloped to provide more than 5,500 new homes, community facilities and better public spaces. The regeneration of Woodberry Down was first planned in the 1990s after structural surveys showed the 2,000-home estate would be too costly and complex to refurbish and was in need of comprehensive redevelopment. Most of the Woodberry Down estate was constructed in the 1940s and 1950s and when it was built it was considered to be a model for future estates. Due to the poor quality of building materials available at the time, coupled with the unusual construction methods used, the buildings and the wider design of the estate have not stood the test of time. There are a range of different issues ranging from damp to structural problems. Plans approved in 2005, and updated in 2014, mean these homes are being gradually demolished and replaced with 5,500 new, high-quality homes that make better use of the land and provide new properties for social rent and shared ownership for existing residents. 41% of the 5,500 new homes being built over the 20-year period will be for social rent or shared ownership. Secure council tenants are guaranteed the right to return to a new Notting Hill Genesis home at a social rent, while leaseholders are offered a range of options, including the opportunity of a new shared equity property at Woodberry Down. Residents are also entitled to a package of financial compensation and support for the disruption of moving home. As well as new homes, the regeneration will bring a host of new community and commercial facilities to the area. The Redmond Community Centre opened in 2012, and a range of new shops and cafes are now operating. The opening of the stunning Woodberry Wetlands by Sir David Attenborough in 2016 has opened up the East Reservoir bordering the estate to the public for the first time in nearly 200 years, and this is now managed as a free wildlife reserve by the London Wildlife Trust. New play facilities at Spring Park and the new Skinners Academy secondary school have been opened, while The Edge youth centre and Woodberry Down Primary School have both been refurbished. 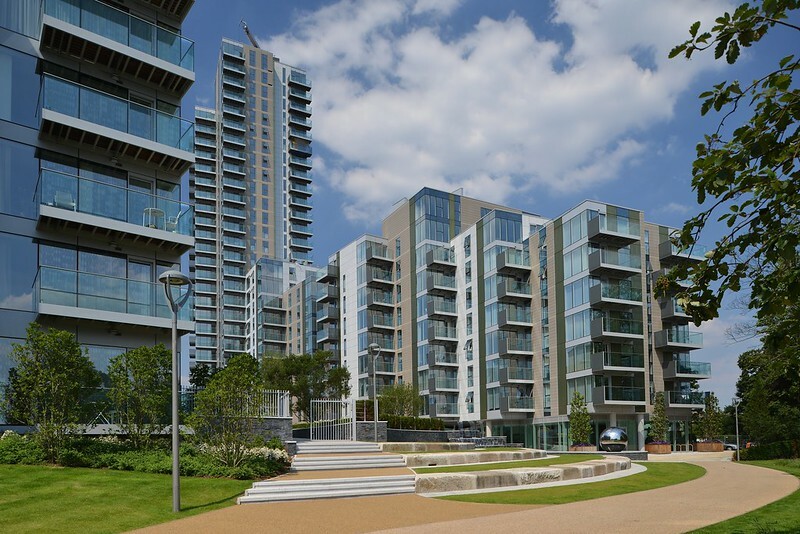 Berkeley Homes is the developer for Woodberry Down and is responsible for building all of the new homes. It also markets homes for outright sale to help fund the rest of the regeneration. Notting Hill Genesis is a charitable housing association that manages all new homes for social rent and shared ownership. It is the landlord of residents moving into these homes. Hackney Council continues to manage and maintain all existing homes on the estate, as well as providing dedicated support for those needing to move to a new home. The Woodberry Down Community Organisation is the representative community organisation involved in the regeneration, made up of neighbours and activists from across the estate volunteering their time to ensure that local people are represented. The Manor House Development Trust is a charitable social enterprise championing community development within the Woodberry Down regeneration. Construction began in 2009, and 1,502 homes have been completed during the first phases. More than 50% of these are for social rent or shared ownership, and many existing council tenants have successfully moved into new homes during this period. Between 2018 and 2022, a further 759 homes are set to be completed as part of Phase 2. The second part of Spring Park and the upgraded Multi Use Games Area (MUGA) are due to open this summer. Berkeley Homes are currently consulting residents on Phase 3 of the regeneration. Cash from sales under Right to Buy - the Government's policy of allowing council tenants to buy their home at a discount - is usually reinvested in Council housebuilding programmes wherever possible. But arbitrary restrictions placed on local authorities by ministers mean the money must be spent within three years of a sale and can only pay for 30% of a new home - leaving councils to fund the remainder of the cost. Often this makes it very difficult for councils to spend the money in reality, and after three years the government takes it off them, along with an interest charge, to use for itself. To try and ensure this money actually benefits Hackney residents, the Mayor of Hackney's housing challenge will make funds available to housing associations to deliver homes for social rent and living rent by March 2020, instead of being forced to hand it back to the government. There's currently £16 million of funding for schemes to be delivered between September 2018 and March 2020, with funding available for up to 30% of the total cost of a scheme.